Congratulations to Charles! You are the winner of our new Awesome Inventions You Use Every Day series! Please send us a DM on Twitter or an email to publicityinfo@lernerbooks.com with the subject line “Free Book Friday” and tell us your mailing addresses so we can get your books in the mail. We want 2014 to kickoff with a wild start so this week we’re giving away Expressing the Inner Wild: Tattoos, Piercings, Jewelry, and Other Body Art from Twenty-First Century Books. Maybe you’ve noticed Kanye West’s grill of gold and diamonds on his bottom teeth or admired Nicki Minaj’s crazy wigs. But have you checked out Chris “The Duchess” Walton, a singer from Las Vegas, who has fingernails that are 20 feet (6 meters) long? Or Julia Gnuse, who is called the Illustrated Lady because her entire body is covered with tattoos? What about baseball player Covelli Loyce “Coco” Crisp? Have you seen the stud implant on his neck? All of this body art is pretty wild, but in fact, people have been decorating and modifying their bodies in fantastic ways for thousands of years. Cleopatra of ancient Egypt wore hair styles to rival those of Lady Gaga. The ancient Inca of South America decorated their nails with images of gods and eagles. Even English playwright William Shakespeare had a piercing! 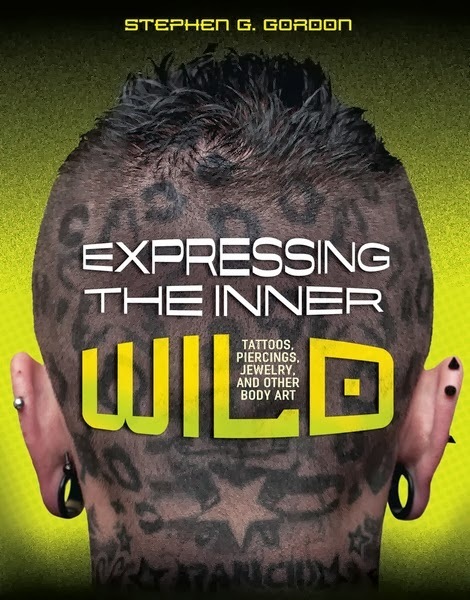 In Expressing the Inner Wild, you’ll read about all the amazing ways people around the globe and across the centuries have been creatively transforming their hair, lips, fingers, toes, eyelashes, ears—just about any body part you can think of—with jewelry, makeup, inks, piercings, and other decorations. From African tribal body paint to ear plugs, tattoo pantyhose, and nail art for guys, you’ll discover the sky’s the limit! We’ll announce the winner during Free Book Friday on January 10 so be sure to come back to the Lerner blog to see if you’ve won!